A recent “adventure” occurred when a bride called six weeks prior to her wedding (instead of the usual nine-to-twelve months in advance) after a dispute with her previous consultant. She needed complete design, production, and management for her ceremony as well as the reception. Our entire team immediately went to work, putting in calls to many of our industry friends to help us pull it off. Without these solid relationships, the task would have been impossible to accomplish within such time constraints. 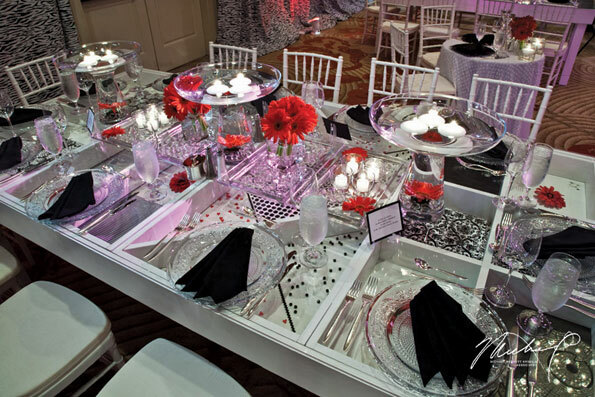 The chic, modern reception was based upon a red, white and black color palette, with each custom-designed table requiring an equally unique floral design. For example, each white lacquer shadow box surface was tailored with unique patterns and textures beneath one-inch Plexiglas toppers. Another “cabaret effect” table design required glass cylinders filled with red gerbera daisies and topped by dripping red Swarovski crystals. Our client was thrilled that we fulfilled all her wishes for a “dream wedding.” Remember, confidence and trust in your design team is critical to your peace of mind as well as the ultimate success of any event.